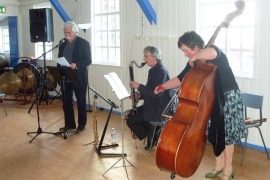 Wordfringe's day at Pennan finished — literally — on a high note, with an evocative and colourful weave of word and music performed by the three-legged phenomenon that is Trio Verso. Brian Johnstone — award-winning poet, and director of StAnza — enunciated his perfectly-crafted lines in such a way as to provide a framework onto which two talented and versatile musicians stitched and embroidered their response, to perpetuate an impressive, living tapestry of sound. Never have I seen a double-bass used, or even abused, in such a way as to emit the chirps, twangs and whines that Louise Major produced. This unforeseen delight was enhanced and complemented by the bizarre clarinet-play, and blasphemous saxophony of Richard Ingham, who had taken to the floor for the second time that day. It came as a surprise to many to discover that the musicians were actually taking their cues directly from Brian's poems, rather than from music scores. Indeed, all the music at this event was improvised. It was an unexpected treat.